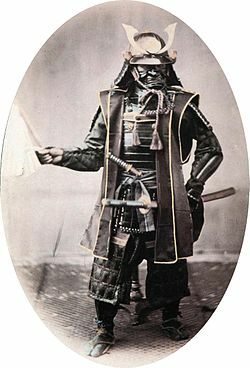 The samurai (or bushi) were Japanese warriors. They were members of the important military class before Japanese society changed in 1868. The word samurai comes from the Japanese verb samurai, which means to serve someone and look up to them. In the 12th century, two military clans, the Minamoto and the Taira, were very powerful. They controlled much of Japan. They fought wars against each other. In 1192, Minamoto no Yoritomo became the first shogun. He became the ruler of all of Japan. He started a new government in Kamakura. This “Kamakura” government was from 1185-1333. It made the samurai the ruling class of Japanese society. Toyotomi Hideyoshi won many wars against other clans. When he made Japan one country, he developed a social caste system. This caste system was completed by Tokugawa Ieyasu and the rulers after him. Between the wars, many samurai had always worked on farms. Hideyoshi said that all samurai must either live on farms or live in castle towns with other warriors. Hideyoshi also made a law that only samurai could have swords. The samurai became very powerful and important near the end of the Edo period (1603-1867) and in the Shinto period. In the Edo period, they were the most important social caste. All samurai had to live in castle towns. The samurais' lords paid them with rice. Some samurai did not have lords. These samurai were called "Rōnin". The "Rōnin" caused some problems for Japan in the early Edo period. In 1615, Tokugawa won a very important battle when he took Osaka Castle. The Tokugawa clan did not have any more rivals. Japan became very peaceful for about 250 years. In these 250 years, military skills became less important. Most samurai became bureaucrats, teachers or artists. In 1868, feudalism ended in Japan. This was the end of the samurai class. Various Japanese (samurai) Tanegashima matchlock firearms. A samurai believed that his swords held his soul. That made the sword the most important thing he had. Samurai were allowed to fight anyone who did not show them proper respect. Every sword had to be tested. To do this, the owner of the sword could execute a criminal. This allowed the warrior to test his sword's sharpness. Samurai led their lives according to the ethical code of bushido ("the way of the warrior"). That meant loyalty to one's master, self-discipline and respectful, ethical behaviour. When a samurai lost his master, also called daimyo, he became a Ronin. If a samurai were defeated or he dishonored himself by not following the code of bushido, he had to commit seppuku (ritual suicide). Part of the seppuku ritual is cutting the stomach or abdomen. That part of the ritual is called hara-kiri. To a samurai, death was better than having no honour or being captured by the enemy. Another reason to commit Seppuku was the death of the daimyo. With this ritual, a samurai was able to show how loyal he was to his dead master. There were periods when Seppuku was forbidden, but some samurai still committed it. The bushi's training methods, like meditation, judo and kendo, are still followed today. There is no longer a samurai class in modern Japan, but the successors of these families are well-respected. Samurai women were trained to defend themselves and their children. They usually did this when their warrior husbands were busy in battles. This is why samurai women were trained to handle polearms (naginata) and short daggers (tanto). During the Edo period, Japanese women were trained to handle naginata by the age of 18. The short kaiken knife was used by young women to defend their virtue or, if they lost it, to take their own life. During the Edo period, women's education became very important. Girls were taught to write, read, dance, etc. beginning at a young age. While the main criteria for marriage changed, among the most important were physical attractiveness and education. Special books were written for women. They mainly taught how to take care of house and children. By the end of the Edo period, women attended philosophical and literary classes. The term "samurai" refers to males specifically. There were a few women who were samurai. One of the most famous was Itagaki. She lived during the end of the Heian period. She owned her own army of about 3,000 warriors. In 1199, Itagaki fought against 10,000 Heike soldiers. She was famous for being very good at handling the naginata sword. Hino Tomiko ruled in place of her husband, Ashikaga Yoshimasa (8th shogun). Toyotomi Hideyoshi's mistress became the master of Osaka Castle after his death. Yamauchi Kazutoyo's wife, Chiyo, was one of the most loyal wives known in Japanese history. She supported her husband during hard times, saving to buy a horse for him. Yamauchi Kazutoyo never took a mistress, though it was a known tradition for samurai. He never left Chiyo, even though she had only one child. ↑ "The Age Of The Samurai". Wikimedia Commons has media related to Samurai. This page was last changed on 27 June 2018, at 22:17.